Some say music is an outburst of the soul. So, what does music mean to you? Does it relax you? Revive you? Make you feel? Lift your spirits? Get you moving? Music can do so much for people. In fact, it is hard to imagine what life would be like if we never had the pleasure of listening to music. If music is your jam (pun intended), be sure to check out this incredible offer for a FREE Spotify Premium trial offer! If you are unfamiliar with Spotify or Spotify premium, allow us to enlighten you! Spotify is a digital music service that gives you access to many, many songs and albums! In fact, Spotify gives you the ability to listen to MILLIONS of songs. Unlike regular radio stations, you get to create your own radio playlist and select the songs you want to hear. 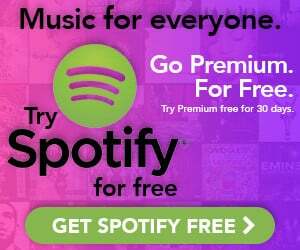 You can download a free version of Spotify, but you will have to listen to commercials and promos. If you take advantage of this FREE Spotify Premium trial, you will not have to listen to those annoying commercials at all! With this Spotify trial, it will be all your favorite music all the time. No interruptions! If you find that you like Spotify Premium when you test out this trial, you can purchase a Spotify Premium membership and the commercial FREE listening will continue!